On July 9, 2018, President Trump nominated D.C. 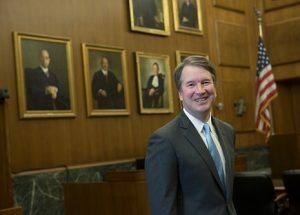 Circuit Judge Brett Kavanaugh to serve as a justice on the U.S. Supreme Court. His twelve-year record on the D.C. Circuit gives us some insight into what we can expect if he is confirmed. His analysis and review of agency decision-making in an appeal involving the San Diego fairy shrimp is a case in point. Designation of private property as critical habitat can impose significant costs on landowners because federal agencies may not authorize, fund, or carry out actions that are likely to “result in the destruction or adverse modification” of critical habitat. Ultimately, Kavanaugh concluded that the Fish and Wildlife Service had not reasonably explained how one, isolated observation of four fairy shrimp (“in a tire rut on a dirt road . . . [that] may not have even existed in 1997”) demonstrates that plaintiffs’ property was “occupied” by the San Diego fairy shrimp in 1997. Writing for the panel, Judge Kavanaugh therefore reversed the district court’s decision and vacated the agency’s designation of the Plaintiffs’ property as critical habitat for the fairy shrimp.